COMPUTER BIBLE GAMES WITH VISUAL C# <Table of Contents> is a self-paced semester long self-study “beginning” programming tutorial consisting of 13 Chapters explaining (in simple, easy-to-follow terms) how to build a Visual C# Windows applications and games. Students learn about project design, the Visual C# toolbox, and many elements of the Visual C# language. Numerous examples are used to demonstrate every step in the building process. The tutorial also includes several detailed computer projects for students to build and try. We have also included the source code to several college prep bonus projects including a loan calculator, portfolio manager, and a checkbook balancer to get you ready for those college courses. Click <here​​> to see some completed project screen shots. COMPUTER BIBLE GAMES WITH VISUAL C# is presented using a combination of over 700 color pages of course notes and actual Visual C# examples. No prior programming experience is necessary, but familiarity with doing common tasks using Microsoft Windows is expected. A separate Teachers Guide is NOT required as the course is completely self-paced and self-learning. The book actually teaches the student to program so the teacher or parent does not need to learn programming or teach programming to the student. 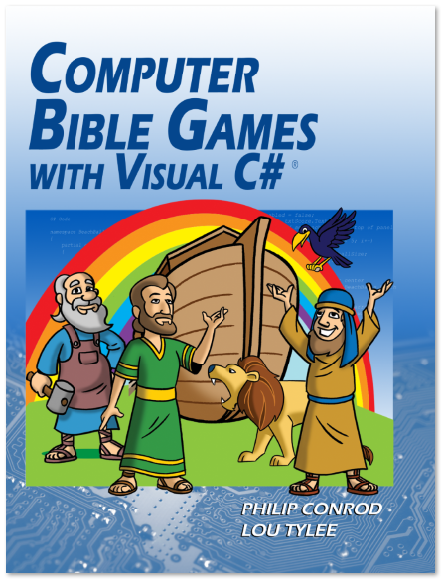 COMPUTER BIBLE GAMES WITH VISUAL C# requires Microsoft Windows 7 and above, ability to view and print documents saved in Microsoft Word format and Adobe Acrobat, and the free Microsoft Visual Studio 2015 Community Edition. This tutorial is currently delivered in the Acrobat PDF, EPUB, Mobi & Word E-Book formats. The entire E-Book and/or selected chapters can be printed on your local printer and/or viewed on your computer screen. The ebook can be downloaded from our website immediately after purchase or can be retrieved from a download link included in your confirmation email. We compress the download files using a .zip format to help reduce the size of files for faster downloading. We no longer publish printed paperback textbooks as the majority of our online orders have been for our value priced digital edition e-book. We also sell this unique E-Book Tutorial in an annual “Unlimited User” Teacher Edition for Christian Schools or Homeschool Co-ops. ​Our Teacher Edition allows you to distribute the tutorial and source code to any of the students who attend your computer science class. You can customize and personalize the tutorial and the associated source code to fit your unique teaching style whether the class is self study or instructor led.Since this Tutorial is distributed in an editable Microsoft Word format you can add your own teaching text and/or notes around our teaching text.You can add your own diagrams and/or personalize the e-book tutorial to fit your specific teaching needs.Unlike other Tutorials that are paper or PDF based, you can modify our teaching narrative and source code inside the tutorial and reprint as needed. This unique flexibility sets us apart from all other tutorials on the market.